If you wish to find out more about the tuition I offer please don't hesitate to get in touch. You can contact me on 01992 764 141 or via the "Contact Me" page provided. 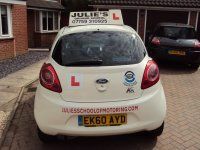 My professional approach and outstanding prices are guaranteed to impress so for driving lessons in Loughton, come to Julie's School of Motoring today!